Yesterday was International GM's Day, a celebration of game-masters (role-playing game referees and judges) that occurs on the anniversary of D&D creator Gary Gygax's passing. 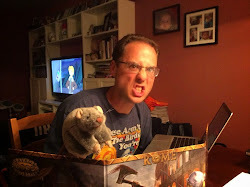 While every player at the table is important in a tabletop role-playing game, it is the game master, dungeon master, or judge that is the creative engine of this method of play. We chose to celebrate International GM's Day by inviting a few friends over to play Dungeon Crawl Classics, with my ten year old daughter Evie at the helm. As I look back to last night's game I wonder. If a judge is the "creative engine" of DCC, then Judge Evie is a rampaging, death-bringing locomotive of chaos and carnage, unleashed from some unknown hell reserved for only those fool hardy enough to step up to her table. This was Judge Evie's first time running Dungeon Crawl Classics, so she decided to leave a delightfully painful mark in the tabletop role-playing game history books. Now, Evie is no newcomer to RPG'ing. She's spent the past year running games of No Thank You, Evil! pretty much non-stop. In one post on the RPG's for Kids Facebook page I noted that she was part of the "No Thank You, Evil! graduating class of 2016. Evie's GM'd games in our house, at our local game club, and even in an official capacity at the Monte Cook Games booth at Gen Con 2016. 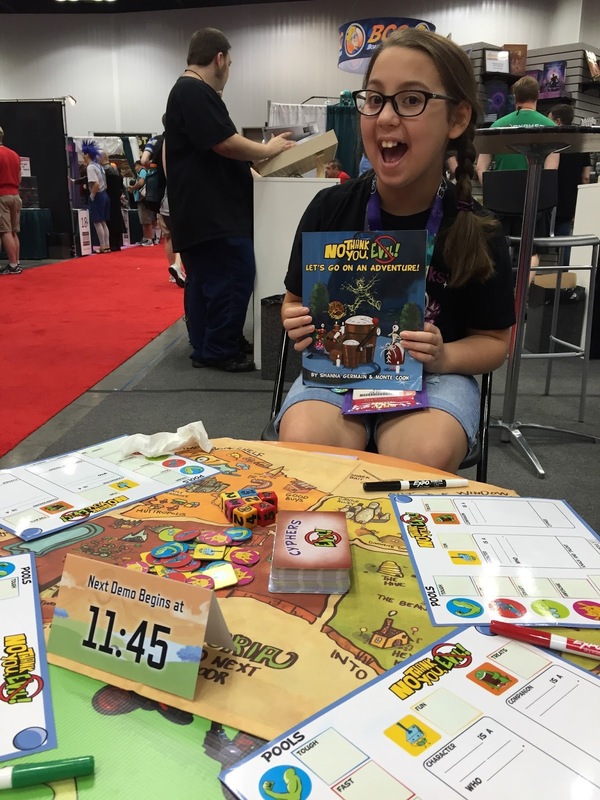 As she's learned to referee role-playing games she's gained self-confidence, an ability to present herself boldly, and sharp improvisational skills. Last night she used all of these against us. For Judge Evie's very first "grown-up" role-playing game adventure, I suggested that she try Nebin Pendlebrook's Perilous Pantry, written by Mark Bishop and published by Purple Sorcerer Games. The layout and design of this 0-level adventure are perfectly suited for a first-time DCCRPG judge, and the whimsical encounters are both memorable and absolutely terrifying. When was the last time you were killed by an undead tortoise chair? Each of our six players (Carrie, Andy, Craig, Dylan, Cooper, and me) were dealt three 0-level commoners for this session, bringing our grand total to eighteen tortured souls to be thrown into Judge Evie's pressure cooker. As I looked over my three characters, I didn't think I'd stand a chance. By the end of the session, Evie had killed all of my 0-levels, as well as all of her sister's characters. Last Night I ran Nebin Pendlebrook's Perilous Pantry and there were eight deaths of eighteen characters including three that died in one attack. It all started out as the players bought some gear before they went into the house of Nebin Pendlebrook. The players started to head into a dark tunnel soon approaching six acid spiders and were now in combat. The spiders took out two characters. The characters continued down the path and found no more than Nebin Pendlebrook snoring on top of of a skeletal tortoise. Neban took a hit to the head and... died. Then the characters were in combat with the skeletal tortoise and six skeletal dwarves. There were four skeletal dwarves that took out all of Carrie's characters! Once they were taken out the characters wanted to go back, but some said to "adventure more." They came across a grub but not much happened. The final encounter had one stone behemoth, one chest mimic, and Varooth Moss [a wizard]. Varooth Moss had fired magic missiles at Carrie, so she was toast. A couple characters died, but not many. The characters decided to head back home and say "Nebin was already dead" to anyone who asked. "She's Jim on steroids," quipped Craig. After dishing out a terrific cache of loot and treasure Carrie commented that Evie "was like a violent Oprah." While I'm not sure what DCC adventure Evie will run next, I'm fairly certain that she's only getting started. So please join me in congratulating my bright and talented yet so brutally bloodthirsty daughter Evie on running her very first "grown-up" role-playing game. I'm so proud of you kiddo, and look forward to dying by your dice again very soon!